This is free! It will enter your information into a free map-based searchable database used by the public and many shelters to look for matches of lost and found pets. This will also allow you to generate free flyers to use immediately. Flyers are one of the most effective ways to find a lost pet. Next, Search the Helping Lost Pets (HeLP) database. Many shelters and citizens use our services, so your cat may already be listed with us! There are many ideas here. 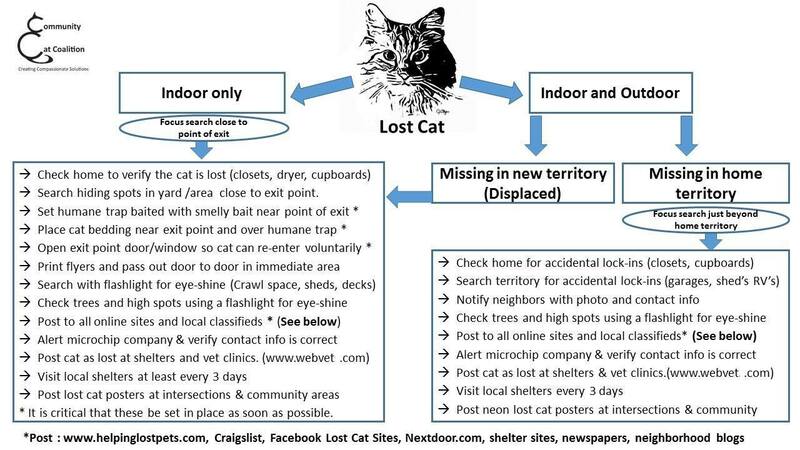 Please don’t feel you have to do them all right away, but we feel it’s important to provide you with as many ideas as possible to help you find your cat. Look through the tips provided on the and Facebook page too. Many of the ideas will help you to find a lost cat too. 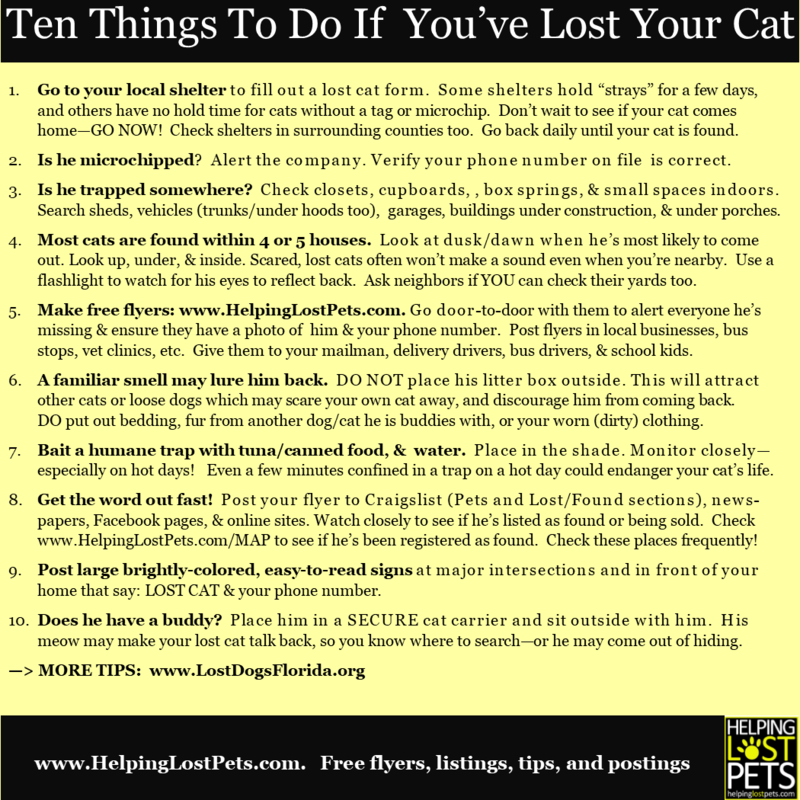 Start with the "Ten Things To Do If You've Lost Your Cat". Put out food and water, and a scented item where your pet was last seen - their bed/ favorite blanket, and an unlaundered article of your clothing. Don’t put out dry food; use smelly food to lure them in –canned cat food or tuna! If you have a another cat that your lost cat is buddies with, place them in a secure cat carrier on the back porch (out of the sun) and allow them to cry a little. That cat's cry or scent maybe lure them back home. The smells often lure them back. This also works when a pet goes missing from a place other than home. Thoroughly search inside your house - you'd be surprised how many cats are found hiding or accidentally closed into a closet, etc. Most (92%) cats are found within five houses. Next, thoroughly search your yard - look up into trees, on top of roofs, inside cars, garages, sheds (sometimes they accidently get closed inside), under houses, bushes etc. Often cats won't come out or even meow when their owner is standing right next to them because they're so afraid/overwhelmed with their surroundings. Then ask your neighbors if you can search their yards too. Lost cats are more likely to feel safe enough to venture out from their hiding spot at dusk or dawn when things are quieter. You may be able to use a flashlight to look for the refection in their eyes. If your cat is microchipped: Contact the microchip company to alert them that your cat is missing. Be sure they have your current phone numbers. Ask them to notify you immediately if your cat is scanned. Veterinarians are not required to notify you. If your cat is wearing their rabies tag: Contact your vet/shelter (whoever administered the vaccine) to notify them that your cat is lost. Make sure they have your current phone number. Go to the shelter. Bring along a clear and recent photograph of your cat (you can use the flyer you made from Helping Lost Pets). Ask if there are cats in other areas such as Medical or Isolation. Don't assume the shelter will call you if your pet is found. Your cat may look different after a few days outside and not resemble the picture you supplied them. You'll recognize them, but a stranger may not. Check back daily - if at all possible, in person. Check shelters in the surrounding counties too. Pets travel farther than you think! Good Samaritans often pick up lost pets and take them to the shelter that’s closest and most convenient for them. The shelters are run separately, so you'll need to contact each one. Pets are only kept for a mandatory hold period – often only several days. After that, if your cat doesn’t have a microchip that can be traced back to you, they are either put up for adoption and adopted (permanently) by someone, or they are euthanized. Finding your pet within a few days is critical! Flyer, Flyer, Flyer! This is the most effective tool to find a lost pet! Leave a flyer at each house in the area so they have a photo and your contact information handy if they see your cat. Be sure to tell people not to chase or call your cat, which can cause them to run farther from where they were lost, or run into traffic! Craigslist: Post your flyer on Craigslist under "Pets" and also "Lost and Found" . Check postings that sound similar to your cat. Many people aren't familiar with breeds. A picture is worth a thousand words! Most people who find a lost pet will place an ad on Craigslist, so check there for THEIR ad. Also watch under the “Pet Section” to make sure your cat isn’t being sold or rehomed by someone. If you have people helping you: The best thing for friends to do is to help you with flyers. 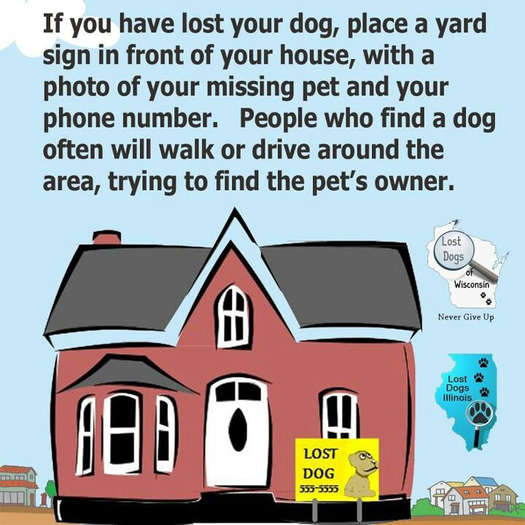 A lot of commotion and people “helping look of your lost pet” may cause the pet to hide or run. If they do see your cat, instruct them not to chase or call them, but to call you instead! Change your outgoing message on your answering machine/voicemail asking for the date, time, and location that the caller may have seen your missing cat. Ask them to leave their name and phone number in case you have question. Another option to going door to door with flyers: The USPS Every Door Direct Mail® costs 14.5 per flyer. You pick the neighborhoods you want to reach, and the mail carrier takes them to each home while delivering the mail. https://www.usps.com/business/every-door-direct-mail.htm. Give flyers to delivery people and utility workers (meter readers, road crews, etc.) since they spend considerable time in the area - UPS, FedEx, your mail carrier, pizza delivery, even bus drivers! Take flyers to vet offices, pet stores, grocery stores, farmer’s markets, events, gas stations, etc. Anywhere there are people! Talk to kids in the neighborhood. They spend more time outside and can often help. The more people that know your cat is lost, the more likely they'll be reunited with you. Put up signs (like garage sale/for rent signs) that say “Lost Cat”, a picture and your phone number in front of your house or the area they were lost. The person who found your cat may be trying to find you. Put the flyer/photo in an upside down sheet protector or Ziploc bag to keep it from getting wet. The more people who know your cat is missing, the quicker you're likely to find them. The following ideas have proven to be very effective! This large sign was made with a tarp and brightly colored duct tape for the writing which is on both sides. It gets a lot of attention and is readable by people driving past without stopping!! ​​For intersection alerts - This should include your phone number too! Have another person available to run up to stopped cars (carefully) to give out a flyer with your pet's photo on it (so they have it later to refer to) and your phone number on it. You can make flyers that are 4 to a page to save on printing costs at www.HelpingLostPets.com. The person who found your cat may be searching the neighborhood looking for you. Place a sign in your front yard that says "Lost Cat" and your phone number. We hope your cat is home soon!